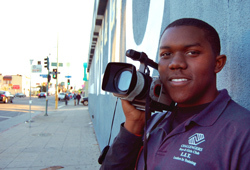 Making a documentary about his South Central neighborhood helped Justin, 15, see that people can make it better. People shouldn’t look at South Central as bad. There are people who live here who are trying to make things better. This community, which I’ve called home my whole life, just needs a chance. Jessica, 17, thought racing dragon-shaped boats would be a good way to get community service hours, but instead she learned a lot about teamwork and competition. Teens at L.A. Youth say cheating is common at their schools. When we talked about it at a staff meeting, students differed on whether cheating is right or wrong. Sam, 16, interviews NBA great Kareem Abdul-Jabbar about a new program to help young players raise money for their basketball teams and what's important about the game. Although a law limits the use of cell phones, people are still talking and the roads aren’t any safer, says Joyce, 17. Working on a gay-rights documentary helped Rene, 17, see the importance of this issue. Elliot, who disagrees with Rene, and Stephany, who shares Rene's opinion, offer their thoughts as well in separate opinion pieces. Solange, 18, says that making and selling her own jewelry is a fun way to earn money. WITH PHOTO GALLERY. As the youngest of three siblings, public colleges fit 17-year-old Aaron's family’s budget. It used to hurt when other black students teased Britawnya, 18, for “being white,” but she no longer cares about fitting in. Justin, 16, says he’ll always remember the days he spent with his grandpa before he died.